The Northern Cardinal is a popular songbird and the state bird of Illinois, Indiana, Kentucky, North Carolina, Ohio, Virginia, and West Virginia. If you see a large, brilliant red songbird with a tall crest singing it's heart out, you are most likely watching a Northern Cardinal. Northern Cardinals are commonly found on the edge of forests, woodlands, parks and in your own backyard. Since they mate for life, Northern Cardinal pairs stay together year-round and often have two to three broods each year. Northern Cardinals eat insects, fruit and are regular visitors to yards with seed-filled bird feeders. These bright, colorful songbirds are found in most parts of the country, and are often seen at bird feeders and birdbaths. The distinctive appearance, eating and nesting habits, and beautiful songs of the Northern Cardinal make them a favorite of many backyard birders. No other bird is so popular here in the United States. At over 8.5 inches long, the Northern Cardinal is one of the larger songbirds you're likely to see at your bird feeders and around your yard. They are fun birds to watch, and are likely to be found singing and nesting at eye-level, making them easy to observe. Both male and female Northern Cardinals sing, which is unusual for birds. While the female Northern Cardinal is less colorful than her male counterpart, her warm colors still stand out. Many Northern Cardinal pairs stay together year-round, so when you spot one bird, be on the lookout for more. They do not migrate, so once you have attracted Northern Cardinals, you can often enjoy their visits all year. 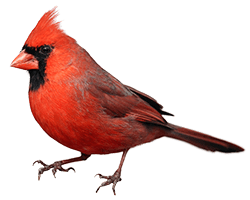 Cardinals live in most parts of the United States, but are rarely found out West. They like to live on the edge of forests or woodlands, in parks and in backyards across the country. They use overbrush for protection and nesting sites, so you may find them living comfortably in a bush or vine near your home. In winter, Northern Cardinals will join other birds in a mixed flock but when mating season arrives the male will become very territorial and protective of its mate. You may have heard stories of birds that fight their own reflections in windows or mirrors. It's not uncommon to observe Northern Cardinals exhibiting this behavior. Northern Cardinals usually mate for life, and begin breeding in early spring. The pair will search out possible nesting locations. Once they choose a location, the male keeps a watchful eye out for other birds and predators, while the female begins the task of building a nest. The female builds her nest in a dense shrub, vine or tree using leaves, grass, tree bark and twigs. She is quite particular about the nest, and will use her sharp beak to shape the nesting materials around her. Lined with soft grass, vines or pine needles, the nest will be complete in a around a week. When the nest is complete, the female Northern Cardinal will lay three to four eggs on average. She will incubate the eggs for up to two weeks, until they have hatched. Her mate will take care of feeding her and will continue guarding the area, chasing off any other birds that get too close. After the eggs hatch, the young Northern Cardinals stay in the nest for nine to eleven days. During this time, the male is caring for the fledglings while the female begins looking for a new nesting site. Northern Cardinals rarely use the same nest twice, so when the female has chosen a new location she begins building her next nest. She may do this two or three times each year. Northern Cardinals eat insects, seeds and fruit. 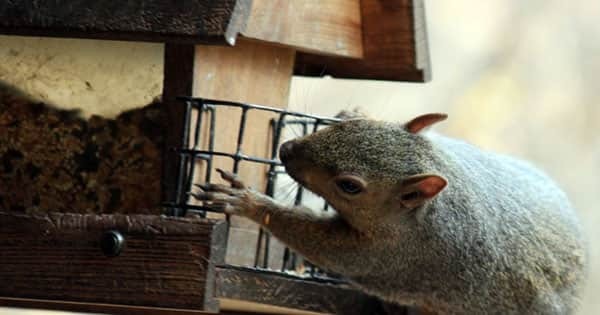 They are larger than many backyard birds so they prefer a solid bird feeder on which to eat. They have been known to eat at traditional hanging birdseed feeders, but really do prefer a well-designed platform or hopper feeder. They say that "the early bird catches the worm", but in this case it is often Northern Cardinals (who do not really eat worms) who are the first birds up each morning. They tend to be one of the first birds you see at your bird seed feeder in the morning and one of the last to leave in the evening. In cold weather and snow, they become less picky about what they eat. While black oil sunflower seeds are a favorite food, they will eat a variety of seeds. Northern Cardinals often eat birdseed put out for other birds once it falls on the ground. 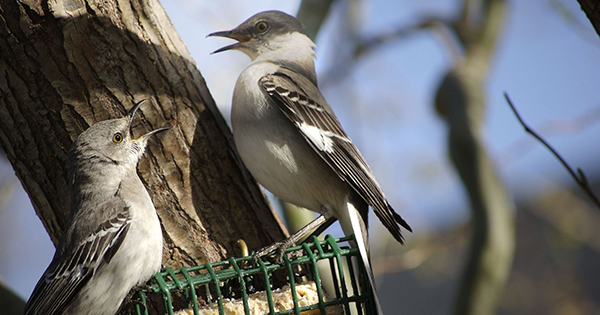 These colorful birds will feed year-round at your bird feeders, and love a well-placed birdbath too. 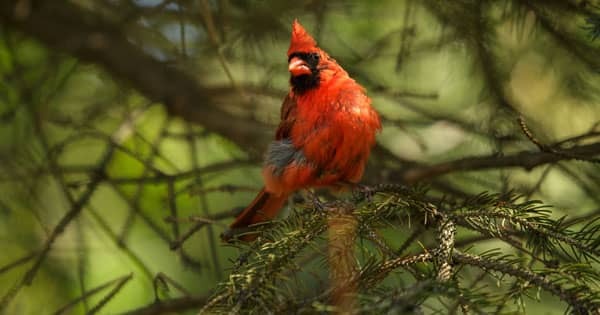 It's easy to attract Northern Cardinals, and they are fun to watch. Since both the male and female birds sing, once you have a pair in your yard you can enjoy their music and colorful visits all year long.